Gugou Children's Bicycle Training Wheels are made of high-quality steel which can bear heavy children without security problems. they fit all 12/ 14/ 16/ 18/ 20 inch children's bicycles. they are sturdy and durable which can keep bycicle beginner stable and help child learn to ride a bike without fear. This is a good choice of fittings for your children to learn the bike at the first time. 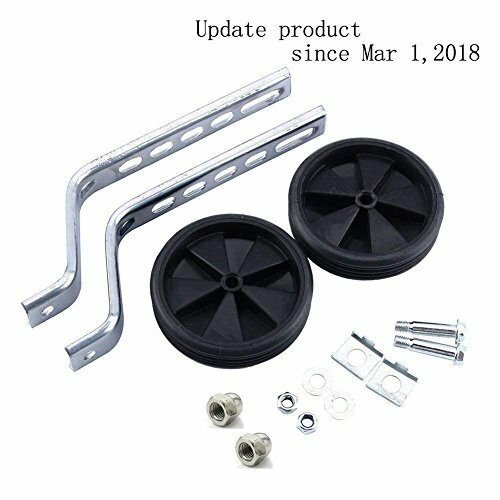 If they are used for 20" bike ,Make sure that the limit block is in the limit slot and both nuts are locked tighten，Only do this,the brackets will not bend. Gugou Children's Bicycle Training Wheels are made of high-quality steel which can bear heavy children without security problems. They are sturdy and durable which can keep bycicle beginner stable and help child learn to ride a bike without fear. This is a good choice of fittings for your children to learn the bike at the first time. This practical training wheels, for bicycles from 12 "- 20", provide the necessary security and stability which it needs in the first road tests on the bike. Gives your child the best start to gaining their balance and confidence on two wheels. If you have any questions about this product by Gugou, contact us by completing and submitting the form below. If you are looking for a specif part number, please include it with your message.